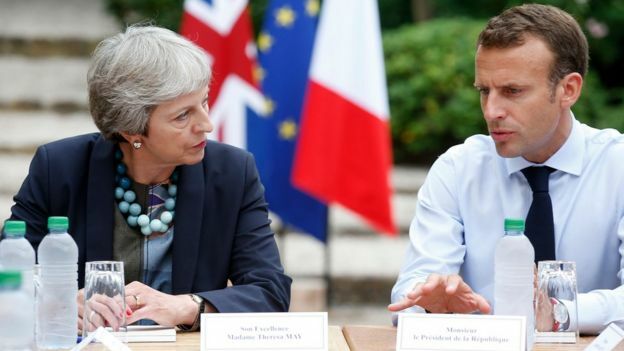 Theresa May is holding last-minute Brexit talks with the leaders of Germany, and France later, with the UK due to leave the EU in three days time. Mrs May is meeting Angela Merkel in Berlin, followed by Emmanuel Macron in Paris, to urge them to back her request to delay Brexit again until 30 June. The prime minister will be at an emergency summit on Wednesday when all EU states will vote on an extension. Cross-party talks aimed at breaking the impasse are also set to continue. The negotiating teams will be joined by Chancellor Philip Hammond, Environment Secretary Michael Gove and shadow chancellor John McDonnell, with the Labour frontbencher saying they hoped to “broaden the talks”. But in a leaked letter seen by the Telegraph, International Trade Secretary Liam Fox has warned that agreeing with Labour over its demand for a customs union is the “worst of both worlds” and will leave Britain unable to set its own trade policy. So far, MPs have rejected the withdrawal agreement Theresa May reached with other European leaders last year. One of the most contentious parts of the plan is the Irish backstop – an insurance policy that aims to prevent a hard border returning to the island of Ireland. She told reporters the “best possible outcome” would be if the “EU decide to support measures on the backstop”, and that she thought it would be “fantastic [if] Angela Merkel will try to support a proper UK Brexit by agreeing to open the withdrawal agreement”. On Monday evening, Parliament passed a bill brought by Labour MP Yvette Cooper, which aims to force the prime minister to request a Brexit extension – rather than leave the EU without a deal on Friday, which is the default position. The government opposed the bill, saying it was unnecessary as Mrs May was already seeking an extension. But the backbenchers behind it wanted to ensure it became law to prevent any changes in her strategy. As a result, there will be a government motion on Tuesday asking MPs to approve the PM’s request to the EU to delay Brexit. Germany’s Europe Minister Michael Roth said Mrs May would receive a warm welcome in Berlin, but his government’s priority was maintaining the unity of the European Union.